Kunai and shuriken are the most common ninja tools. Kunai is a black dagger with a handle wrapped in bandages and a small ring attached to the end of it, which were designed for thrusting and stabbing, though it can still do some damage if thrown despite not being designed for it. Shurikens are sharpened, four-pronged metal stars, useful for throwing, which also can be used for close combat and to distract, pin down enemy shinobi. 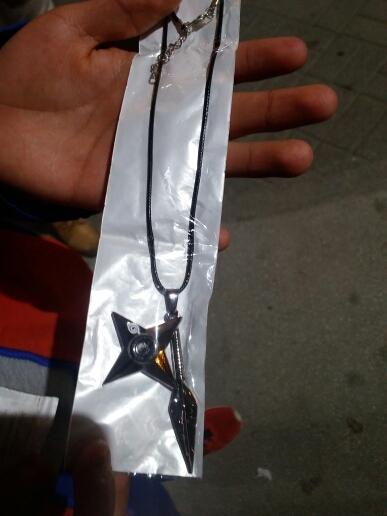 A cute necklace with the pendant shaped as basic shinobis’ weapon – shuriken and kunai. Fast shipping and delivery. Recommend it.